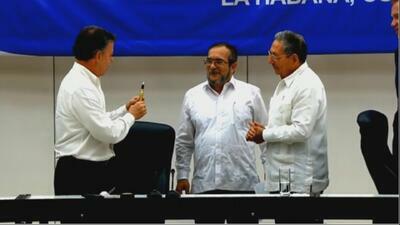 At a ceremony in Havana, Santos and FARC commander Rodrigo Londono, better known as Timochenko, listened to the reading of a deal laying out how 7,000 rebel fighters will demobilize and hand over their weapons once a peace accord is implemented. In attendance were U.N. Secretary-General Ban Ki-moon, a special U.S. envoy and the presidents of Cuba, Chile, Venezuela and other Latin American countries. Associated Press writer Michael Weissenstein reported this story in Havana and AP writer Joshua Goodman reported from Bogota, Colombia.